Hybrid grasses of this type show potential for reducing the likelihood of flood generation, whilst providing pasture for food production under conditions of changing climate. A collaboration of plant scientists from across the UK has shown a grass hybrid species could help reduce the impact of flooding. The BBSRC-funded scientists, from Rothamsted Research, the James Hutton Institute, Institute of Biological, Environmental and Rural Sciences (IBERS) at Aberystwyth University, Lancaster University and the University of Nottingham, used a hybridised species of grass called perennial ryegrass (Lolium perenne) with a closely related species called meadow fescue (Festuca pratensis). They hoped to integrate the rapid establishment and growth rate of the ryegrass with the large, well developed root systems and efficient water capture of the meadow fescue. 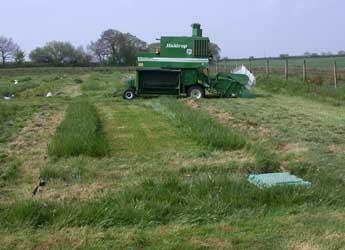 Over two years of field experiments in the south west the team demonstrated that the hybrid, named Festulolium, reduced water runoff from agricultural grassland by up to 51 per cent compared to a leading UK nationally-recommended perennial ryegrass cultivar and by 43 per cent compared to meadow fescue. It is thought the reduced runoff is achieved because Festulolium’s intense initial root growth and subsequent rapid turn-over, especially at depth, allows more water to be captured within the soil. The hybrid grass also provides high quality forage with resilience to weather extremes, making the grass doubly useful to farmers. Dr Kit Macleod, catchment scientist at the James Hutton Institute and one of the authors of the paper, said: “Hybrid grasses of this type show potential for reducing the likelihood of flood generation, whilst providing pasture for food production under conditions of changing climate.